Winner 2017/18 National Junior Cricket Program of the Year! 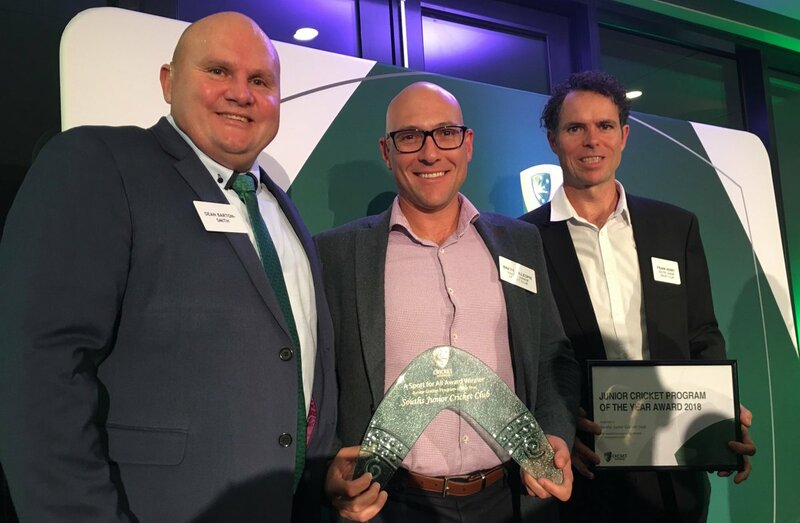 Earlier this year Souths Junior Cricket Club entered into "A Sport for All" Cricket Community Awards in the category of Junior Cricket Program of the Year and Initiative of the Year. On the 9th May, 2018, we were very excited to hear that we had won the Queensland Cricket award for the category of Junior Cricket Program of the Year and were invited to attend the National awards in Melbourne! We received a signed BBL 07 Men's Brisbane Heat bat which will be on display in the clubhouse in the future. Club committee members Brett Gillespie, President and Frank Henry, Secretary traveled to Melbourne to attend the National award ceremony at Cricket Victoria headquarters on the 24th May. It was an elaborate affair with special guests, including the inspirational and very funny former Australian decathlete and cricket tragic, Dean Barton-Smith, AM. The night had the different categories split around dinner meaning there was an anxious wait for our category. It was noted that the "Lucky" Table 7 had already had winners from Cricket Tasmania and Cricket Victoria. Then it happened! We were the winners! Souths Junior Cricket Club has the BEST Junior Cricket Program in the entire country!! It was a great achievement and acknowledgement for all the hard work that our volunteers have put in over the past few years. It could not have been done without you and we thank you so much for all your help. We are looking forward to the upcoming 2018-19 season and we have already started planning to make it even better! !